Tammy is the owner of this family-run catering company. Their pricing was more than reasonable and the food delicious. Tammy went well out of her way to make sure the day went smoothly. They had many challenges to overcome (such as not having a kitchen at the wedding site or running water to rinse after dinner dishes). I highly recommend Tammy's services. Her catering was exceptional! Thank you for all your time, energy and efforts into the Heron School 1980’s Prom themed Gala & Auction. Everyone raved about the food & they want to have another one in the Spring-we will see. It was a pleasure working with you & we could not have done it without your continued support. Our Gross income for the night was $26,941.58! Our total head count was 206. Everything exceeded our expectations, especially the food & Service. Dan and I are so grateful that we hired you as our wedding caterer. Not only was the food wonderful (you got many great reviews), but you were extremely professional and pleasant to work with. I know our chosen wedding site presented you and your crew with some challenges, and Dan and I are so thankful that you were competent and knowledgeable enough to handle them… like no running water! Thank you also for accommodating us with linens, tables and chairs. We really felt that you went above and beyond. Please let us know if you ever need a recommendation – we will enthusiastically give one! Tammy has been a great asset to our annual Christmas party. Our group trusts Tammy enough to simply call with a head count and let her pick the menu. Utilizing Anderson Family Catering the last three yeas has been great. Very professional, EXCELLENT food, great people, and a great price. Every item on the menu is great. Anderson Family Catering catered our son's rehearsal dinner, serving over 60 people in my back yard. The event was set up beautifully, and we could not have asked for better service from Tammy and her crew; they were exceptional. The menu included a fajita bar with home made tortillas, rice, beans, several fresh fruit and vegetable dishes, with strawberry shortcake for dessert. Yummmmm!! Everyone at the party raved about the food. I heard from several people that they over-ate because they just did not want to stop! Thank you for the roll you played in this joyful event! You are the BOMB!! Thank you so much for the fabulous job you did catering our daughter's wedding in August, 2011. From start to finish, you were wonderful to work with. Your menu suggestions were interesting and appealing. Your professionalism, creativity, and service attitude allowed us to enjoy the event without having to worry about the food at all. All the guests loved the food (and especially your sangria!) Your servers were efficient and yet invisible...food was replenished, drinks poured, tables set and cleared, all without us really being aware of their presence. And when your team left a little after midnight, my kitchen was clean! We highly recommend Anderson Family Catering to all we know, and we look forward to having you cater another event for us soon! I attended the Yolo County Women's History Luncheon on March 8, 2012. Anderson Family Catering put on a wonderful lunch for upwards of 300 people. Each of the prepared dishes was made to perfection. From the tri-tip, chicken and rice to the roasted vegetables and creative desserts, the food was terrific. The servers were attentive - my water glass never ran dry! If the devil is in the details, then the Anderson Family crew are catering angels that banish potential devils where ever they might appear. Thank you, Tammy, for a most pleasant event. We would like to thank you for catering our wedding! The food was delicious, and the whole spread looked great. I particularly enjoyed the delicious tri-tip and the garlic mashed potatoes. We hope the rest of the wedding season goes smoothly for you and the family. Thank you, Josh & Cami-Vacaville, Ca. Tammy makes the most delicious food you'll ever taste. Several years ago I had her cater my college graduation party and everyone raved. Her pulled pork sandwiches really are to die for. I've recently become gluten intolerant so was nervous about what to serve to everyone at my wedding. Tammy and her staff came through for me once again. Everything was fantastic and I don't think anyone realized it was all gluten free. I can't say enough good things about Anderson Family Catering and wouldn't think of trusting important events, big or small, to anyone else. My husband Ricky and I had the most beautiful and perfect wedding on October 5th 2013. We had an outside wedding & reception. We choose Anderson Family Catering for our food and we were more than pleased with them and their service. Tammy & her staff went above and beyond with helping make our day perfect. Tammy also helped me with lots of extras such as making signs and setting up tables, flowers & linens. Anderson Family Catering is the only way to go! Ricky & Christee, Winters, Ca. 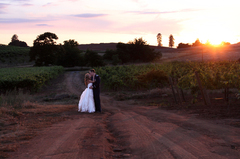 Brent & Kim Stephens, Owners Historic Oakdale Ranch, Esparto, Ca. Tammy and her crew of Anderson Family Catering has time and time again provided outstanding food and service! Anderson Family Catering catered our annual Holiday party last year as well as this year and the food was fantastic. Tammy and her catering crew were very kind when we had 10 extra people show up to the event, they were quick to get some extra seats set up for me and had plenty of food. I heard many positive comments about how much flavor all the food had. We just can't get enough. Thank you Anderson Family Catering for all the wonderful food & service that you have provided to us. I am looking forward to future events. Kelly Gustafson, Winters Healthcare, Winters, Ca. What a great job you did for our daughter, Nicole's wedding! We are so please. The food was delectable, the service perfect, but more than that you are such a delight to work with and your crew so friendly, yet efficient! We received compliments all evening for the food, and I want to pass them on to you. Kent has written a YELP review (which he never does) because he was thrilled with the way the wedding turned out and wanted to communicate his appreciation through Yelp. I hope you like it! Each year we celebrate Women's History Month with a festive luncheon for over 200 men & women in Yolo County. Ever since Tammy Anderson and her family began catering our function we have received many, many enthusiastic comments about how tasty the food is, how attractive the tables are, and how efficient the service is, and how friendly the cooks & servers are. WE congratulate Tammy on her good work and willingly recommend her catering service to all those looking for good food at a fair price.